I had two pressing tasks waiting for me after work and dinner this evening: do something with the bowls and bowls of ripe tomatoes, and take down the hanging stalks of dirty, dried garlic and make them respectable. I did make tomato sauce, and will share photos tomorrow. 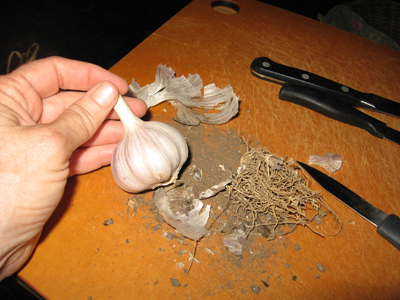 But tonight I’m thinking more about garlic — taking 51 stalks (because we’d already taken three and put them in to various dishes, like simmering tomato sauce) and cutting off the stem and roots, brushing off the dirt, peeling away the purple papery husk, and ending with the clean white husk. It almost glowed, it was so pretty. This garlic had no scent, because I didn’t nick the skin. 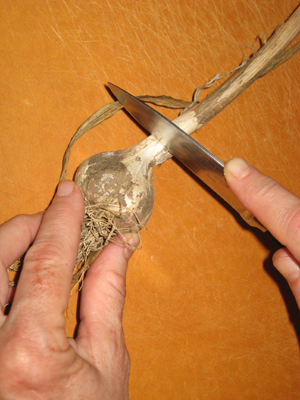 This garlic was all about promise — the curves of those many plump cloves, the proud stalk, the gently rounded bottom. I know each clove has that amazing, wholesome scent, that manages to be both medicinal and aromatic at the same time, but tonight, I was only admiring look and feel. 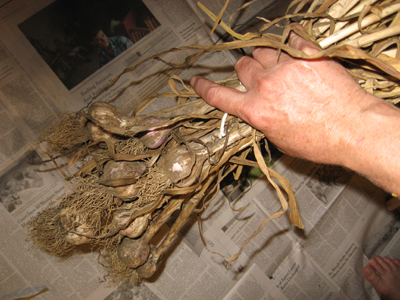 The heaped basket of white garlic was a harvest, something we all rarely have the pleasure of accomplishing these days. It was a basket of food, that will last me quite awhile. It’s not the right variety to braid — a disappointment — but lovely nonetheless. Next year. There’s always next year to braid. I laid several sheets newspaper under and around my tray table, to catch dirt, stems, husks. The stalks were a challenge. Some I could snap, some snap and twist, some had to be sliced with a knife. Lifting the prize away from the stalk, roots, and copious dirt. Why so many knives? I'm always certain the knife I'm NOT using is sharper. I kept switching tools. 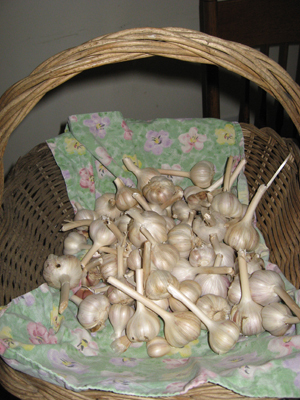 A pretty sight: white garlic heaped into a basket. And they feel as pretty as they look, smooth and curvy. That’s some terrific-looking garlic! Will any of it be making its way to Brewster, by chance? If you comment, they will come. Would you like some? I would be honored to bring some in! I’ll do that tomorrow, and will bring in more tomatoes, too.